I made the mendocino sundress using the free pattern and tutorial. The m/l size was plenty big, even with my belly getting in the way. The only trouble I had was getting the pattern to print correctly since you had to print it like a poster and there was no measurement guide anywhere. An inch square would have come in VERY handy! The sewing was really very easy, and the dress came together quite quickly, although I feel like I wasted a bit of fabric because the length was way too long. If I made it again, (and I would!) I would raise the pockets up and shorten the original length by about a foot, which I ended up doing at the end. I need to find a good bulk option for elastic thread. This one used a lot! I’d been using Dritz, which was not super smooth and switched to Guterman, which was way smoother, but frays more easily. 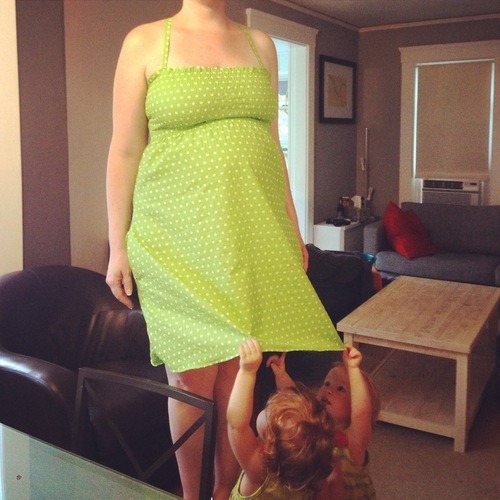 Now if my kids would stop trying to “find the baby” every time I’m wearing a dress, we’d be all set.